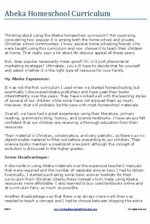 I hope this collection of home schooling articles is helpful as you start homeschooling or continue to teach your children at home. I have published several articles to free directories and thought others could benefit from this listing of my original works. to write and submit more articles. Please feel free to re-publish these as long as a credit is given to the original author (me) and a link provided to the location where you obtained the article (this site). Any other use of these original works, is dishonest and strongly discouraged. I have written these papers to encourage homeschoolers and help those who may want to learn how to start homeschooling and also learn more about how to keep it going beyond primary and middle grades. 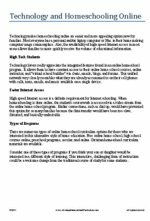 I hope you can find an article here that is beneficial to you in your search for excellence in training your children. Remember, this list will have content added to it regularly so check back often. Hopefully, you were able to find some useful information, reviews, and encouragement within these articles for your use or possibly a homeschool group newsletter or ezine. Thanks for taking a look and feel free to contact me if you need further permissions for use beyond what is stated here already.